Remember my Tarte Tatin? 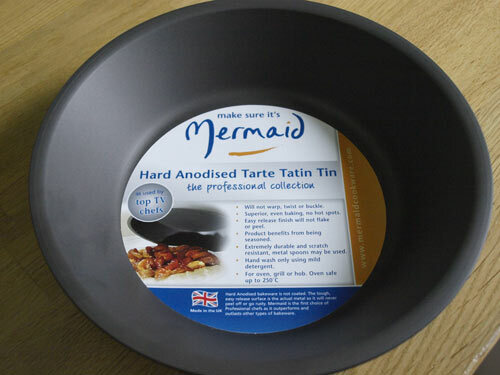 Well, those lovely people at Mermaid bakeware would like to help YOU to make our own Tarte Tatin by giving away one of these high quality hard anodised baking tins. Complete the Rafflecopter widget to win the Tarte Tatin tin, but just in case you are not the lucky winner, you can buy this tin 'on sale' at Amazon for £21.54 it will last you a lifetime and would work for pies as well as the Tarte Tatin. I luv tart tartin with banana and a good scoop of vanilla icecream! Prob a classic tarte tatin. I would like to try a banana one, though. I love a jam tart! especially when its hot from the oven with a splash of cream. I'm thinking of trying a peach tart with tons of almond. I'd make a savory one with pumpkin. I think a good Bakewell tart is hard to beat! Oh yes please Janice. 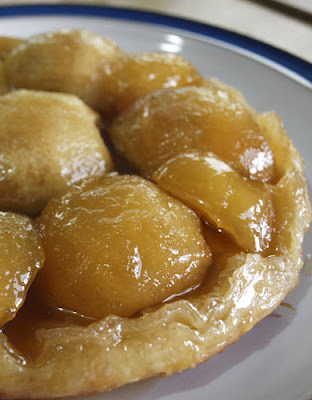 I've never made tarte tatin and am quite keen to try it. As for my favourite tart, I guess I have to say chocolate! Bakewell tart without a shadow of doubt! I love a Rhubarb tart with baked rhubarb on a pastry base that is then covered with a meringue type mixture it is devine! My favourite is Yorkshire Curd Tart! Think I'd have to go for a French flat Apple Tart, with a redcurrant glaze. Something citrus, like a Lemon Tart, is my first choice. I love bakewell tart, yummmyyy.